Brother Monkey and I visited Papa Monkey out in the sticks today. 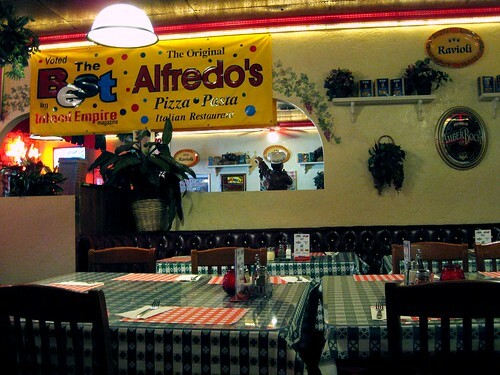 We went to Alfredo's Pizza & Pasta (251 W. Baseline Street, San Bernardino) for lunch. 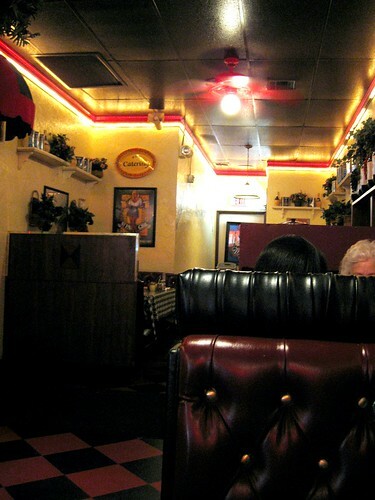 Alfredo's is an old family-run establishment with checkerboard decor. It serves Italian comfort food that's Americanized but familiar and tasty. Alfredo's is particularly familiar to Papa Monkey, as he delivered several of the owners' and employees' children and grandchildren. 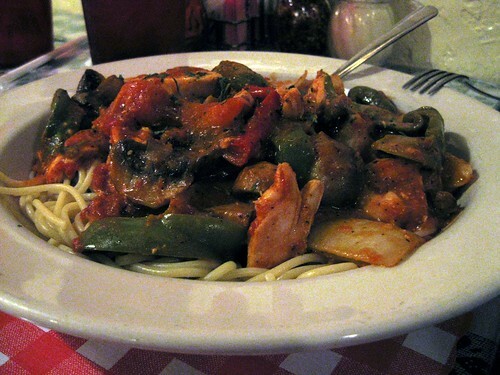 Brother Monkey's chicken cacciatore ($8.95) looked tantalizing -- tender chicken breast simmered in a white wine marinara made with fresh peppers, mushrooms, onions, and tomatoes served on a bed of spaghetti. 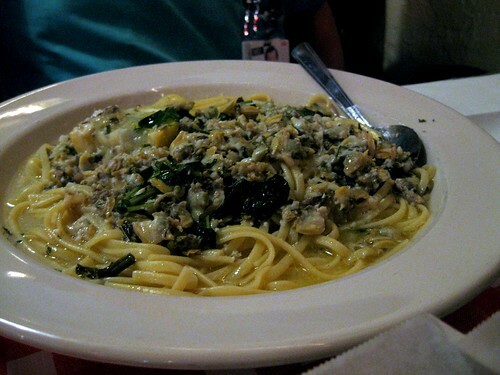 Papa Monkey got his usual linguini and clams with white sauce ($8.95) steeped with garlic and olive oil. 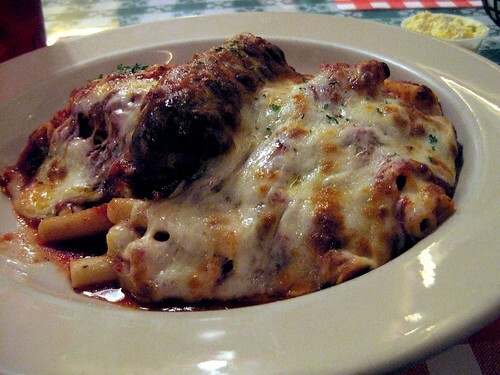 Alfredo's 3-Way Combo ($8.95) includes baked lasagna, sausage, and mostaccioli loaded with mozzarella cheese and sauce. The sausage was deliciously zesty. 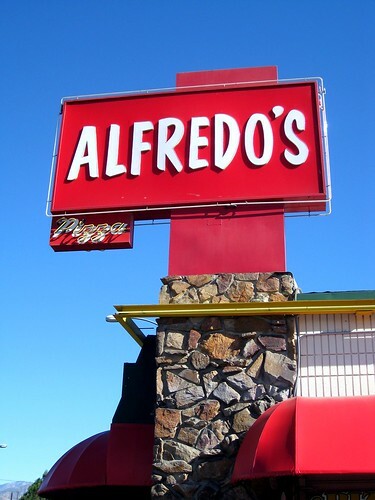 The food at Alfredo's is neither authentic nor gourmet, but the service is warm and friendly, and you will leave happy with a full belly and a large box of leftovers. Addendum: Now that I'm so used to my DSLR, it almost hurts me to post pictures from my point-and-shoot. What a difference a camera makes, no? i just got home from a wedding and a big bowl of pasta sounds soo comforting. ;-) actually i'll take a nice helping of lobster mac & cheese from tonight's wedding. yeah -- it was INCREDIBLE. anything covered in cheese is a winner in my book. Hee. I agree with you re: the camera. However, traveling with the point-and-shoot is far easier than with the DSLR so I truly do love them both equally. I love the first picture - thought that was your DSLR! Pasta never fails me. I love it so. You're so brave venturing out to the boonies. I would knock you over for that 3-way combo right now. Alfredo's is another lunchtime favorite for the office. Depsite being in the hood I feel safe going there because it's a total cop hang out. :-) Now I want a ginormous roll with garlic butter. OH EM GEE - that's brother wan's restaurant!